Looking for a terrific opportunity that’s simple, convenient and hassle-free? 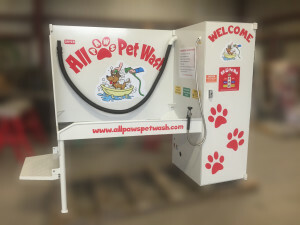 How about a Pet Wash vending station? As a business opportunity and a creative way to help pet owners, Pet Wash systems are easy to maintain, fun to operate and a super simple business venture that’s sure to clean up. Dog Gone Dog Wash is the Missouri / Kansas Distributor for All Paws Pet Wash. We currently have one location in Lee’s Summit, MO. Dog Gone Dog Wash Pet Wash is family-owned and operated in Lee’s Summit, MO. Since our family owned company C K Enterprises opened its doors in 1981, we’ve treated every customer like they were a part of our family. We want to share with you just how easy it is to use one of these pet washes and in doing so, giving your pet A Dog Gone Good Wash! 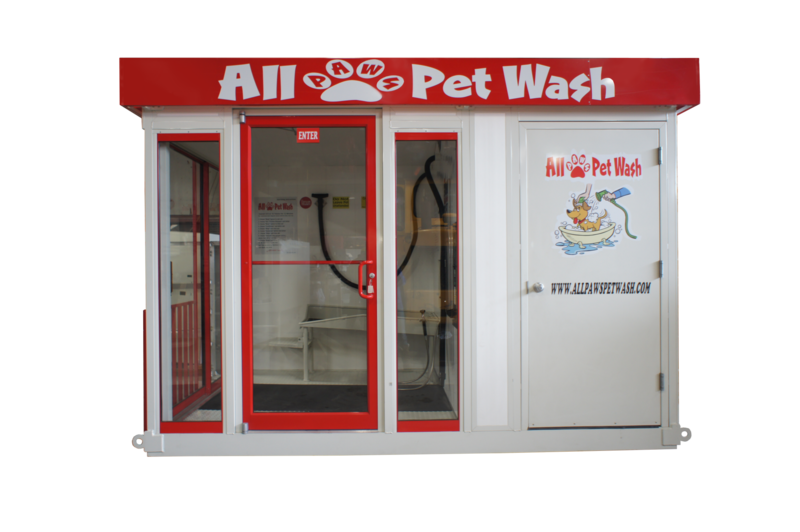 A single modular pet wash vending station measures 8′ x 13′ and consists of one self-service pet washing bay area and an equipment area. Every singular modular dog wash vending station comes equipped with a stainless steel tub in your choice of small or large, coin and bill collector with selector, hot water heater, overhead lights, spray controller, trap for pet hair, hair dryer, and hair vacuum. It’s the perfect one-stop-shop commercial dog washing station with everything necessary to wash, dry and fluff. If you decide to offer tokens as a payment option, we have a complete package ready to place in your pet wash, making it even easier for you to run your business. A token package consists of a token dispenser with a bill validator for denominations of $1.00, $5.00, $10.00 and $20.00. Also included is a coin validator in the spray control and the vending machine(s). The token package includes 2,500 proprietary tokens. Add an additional convenience to your pet wash by accepting credit cards as an another payment method. In most circumstances, your business’ existing credit card system can be implemented into the pet wash card reader system. 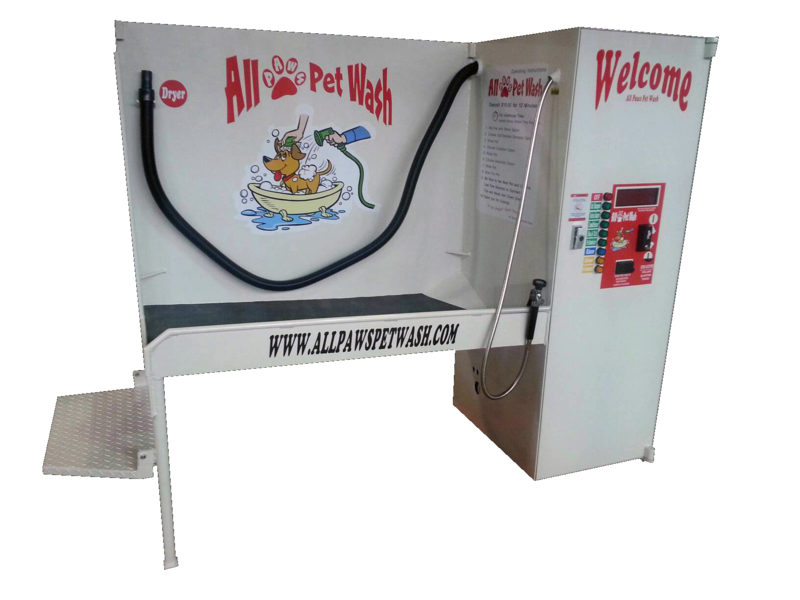 Do you own a carwash or convenience store that could benefit from the addition of a self-serve pet wash business? APW Option A would be a perfect addition to your business. APW Option A comes complete with a coin and bill acceptor built right in, making it available for customers to use at their convenience, 24/7. 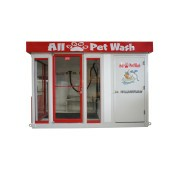 Do you have a pet friendly business that could benefit from having its very own pet wash station? If so, APW Option B would be a great addition to your business. With APW Option B, you determine who gets to use your pet wash and when customers pay you up front for use or service. Perfect for groomers, boarding kennels, doggy day care facilities, or the like. If so, APW Option C would make a great addition to your facility. APW Option C is set up to make it the perfect additional amenity to apartment complexes, campgrounds, private communities and the like. Option C is a free-amenity unit, made accessible only to those who have allowance to use it, as determined by the property owner or manager. Do you have constrants on your install location? Pick the best APW Pet Wash Station with the option you require BUT give it a Flip Tub! Don't require a tub at your install location? 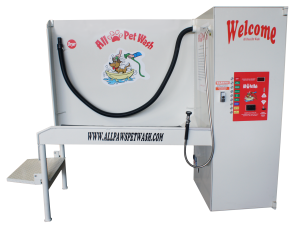 Pick the best APW Pet Wash Station with a cabinet only option!